Uses a highly concentrated formulation to lower bromine and chlorine levels in spas and hot tubs. Reduces chlorine and bromine levels in pools and spas. Compatible with all other spa chemicals. Does not reduce chloramines or combined chlorine levels. Spa Care™ Chlorine Corrective is highliy concentrated so do not add more than the required amount. 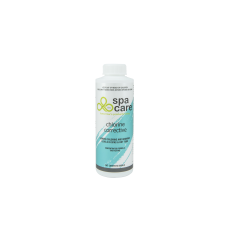 Spa Care™ Chlorine Corrective should be added in accordance with the directions given.